How did THAT happen? Suddenly it’s August and the dog days of summer. I feel like summer just began, yet I’ve seen friends in Arizona already go back to school. Yikes! Meanwhile, here in Michigan, we won’t return to school until after Labor Day. That means I still have a few weeks left to enjoy the hottest time of year. And I will soak up every minute of the warm temps and sunshine. Last year I think it snowed on Halloween so I’ll take all the heat Mother Nature can throw at me! 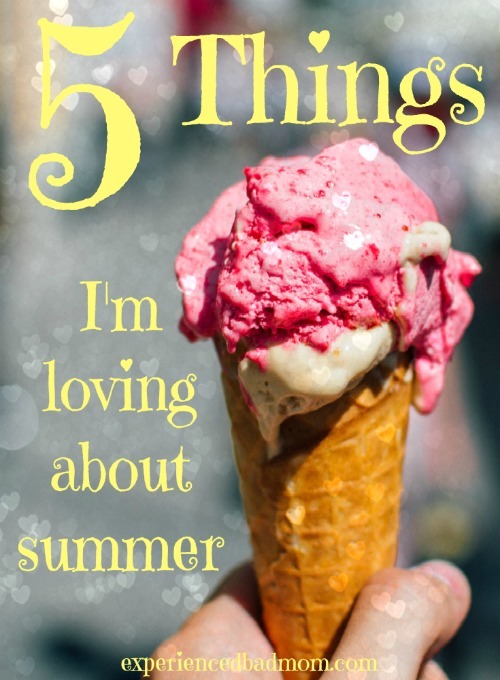 Here are 5 things I’m loving about this summer. These 5 things pretty much work for every summer in my book. Ice Cream. I think calories from ice cream don’t count in the summer. That should be a law of the universe for sure. Vacation. This summer our family explored the Pacific Northwest. 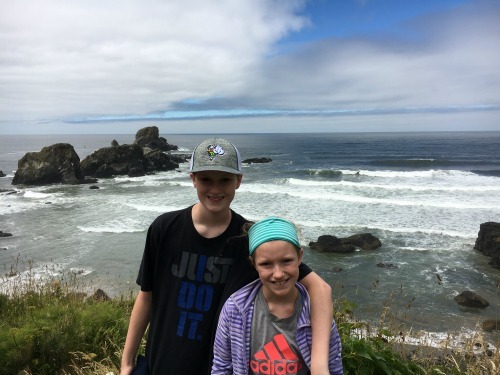 I loved taking my kids to the Pacific Ocean for the first time. And what’s not to love about vacation? Well, okay, maybe the bills. Fairs. 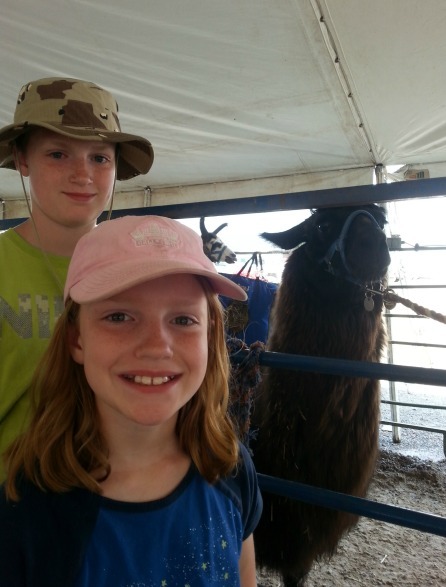 We visited the 4H fair last week. It’s fun to see all the different animals, like lambs and pigs. It’s also interesting as the youngsters who show their animals at the fair educate us about them. We are suburbanites after all. Did you know llamas have a life span of 20 years? Being outside. 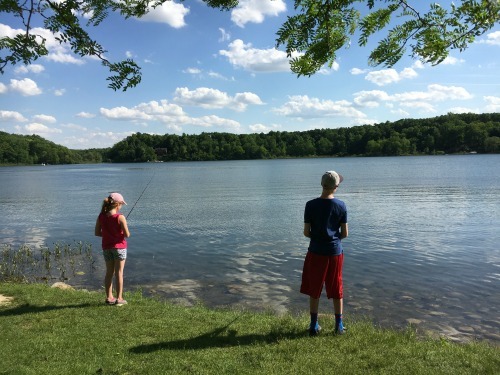 In the summer, we go fishing. We ride our bikes. I sit on my deck and drink a beer. It’s all good and things that, sadly, I can’t do in January in Michigan. Well, I guess I could go ice fishing in January but me thinks that doesn’t sound as enjoyable as going fishing in the summer. I could blather on about everything I am loving about summer, but what about you? What are you loving about summer this year? Ok so now I’m hankering for an icecream. It’s 12:00 midnight and I’m at the airport awaiting the arrival of my son whom I’ve not seen since Christmas. Fair to say I’ll have to wait until tomorrow to get that icecream. Best part of my summer? Having both kidlets home for a solid 2 weeks! Yay! Enjoy your next couple of weeks, Katy. Fingers crossed I do not see an international headline re: a crazy woman at YVR attacking the ice cream stand! The ocean was a highlight! I want to go back. Just too far. #1: they absolutely don’t count in the summer! Who told you that they did? They were lying. Hi Katy, it sounds as if you are making the most of summer and I don’t blame you if the threat of snow isn’t too far off. An as for fishing in January, even the thought is utter madness! I enjoy the evening swims (or early morning ones) this time of year, although we’ve not had many this year. I really must make the effort before summer is all over! 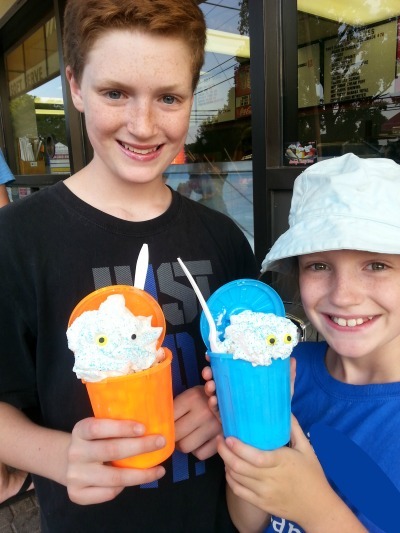 At the very least you had ice cream this summer. Although, I think you could eat it year round in AZ, right? I love fairs! And fair food. Plus ice cream. Sleeping in is my favorite about summer. I love sleep. I get to sleep in a few days a week during the summer. It’s lovely. I confess I do like sleeping in cooler weather though when you can snuggle down into a comforter and its so dark out. Ahhh. But then there’s this thing called WORK that makes me get up. In the dark. In the cold. Okay, I like summer better. Ooooh, this just puts me in a great mood! I LOVE all those things!! This summer has been so crazy with my mom moving here, I’ve not had much time to relish in it- until the past day or two. And I used them to catch up on work and *stuff* but I’m starting to finally FINALLY feel the summer peace hit my heart. Just in time for the kids to go back to school. Ha! Well, we have a few more days, anyway. Yes, Chris, my fellow midwesterner there is something about swimming in the summer that is GLORIOUS. Must be the promise of a frozen 6 months looming!! Enjoy these hot days my friend.